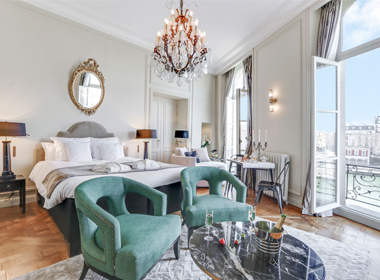 One cannot find a better base for Parisian holidays, with an excellent mixture of « le Grand siècle » on furnishing and comfort, and all the conveniences of the 21st century. Separate bathroom with shower, washbasin, lit mirror, toileties & WC. 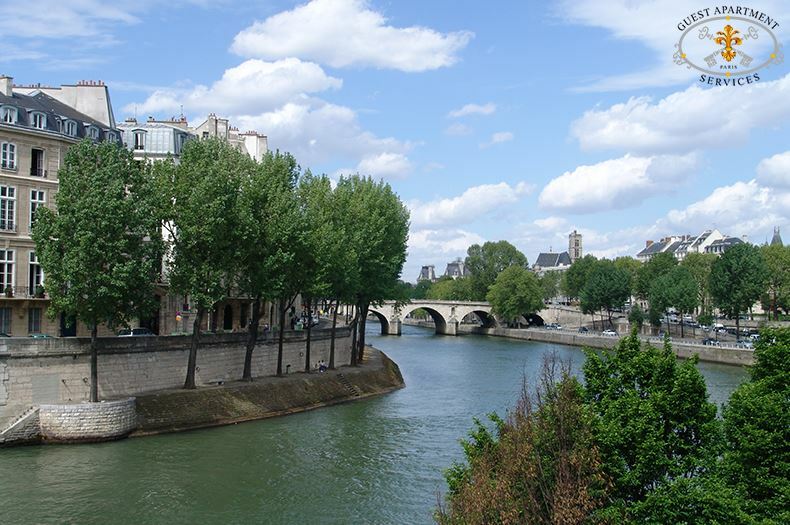 Stunning view on the Seine and its tree-lined quays. Located on the Ile Saint-Louis, in a 17th Century edifice, this privileged property has been entirely renovated and offers all expectations: great location, historic neighborhood, the modern conveniences of home and the old world charm. 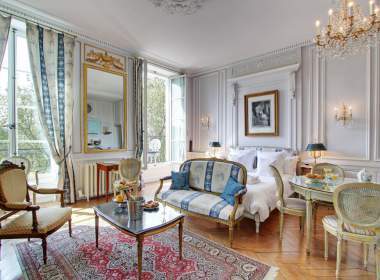 You cannot find a better base for your Parisian holidays, with an excellent mixture of « le Grand siècle » and all the conveniences of the 21st century. Prestigious address on the much-sought-after Ile St Louis. Located on the 2nd floor with easy access by a grand stone staircase classified among the National Monuments. 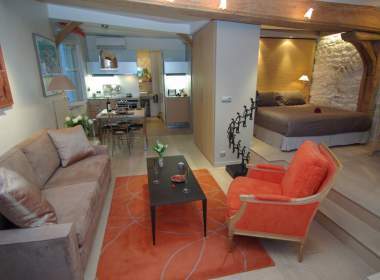 Moderate sized apartment vacation rental with separate loft bedroom and separate living room. 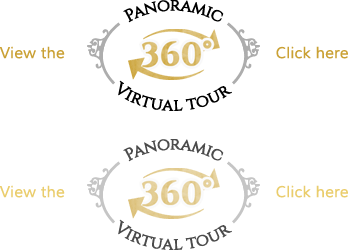 Exquisite views of the river Seine and Paris monuments. Elegantly appointed with high ceilings and tall double glazed windows that bathe this cozy apartment in Natural Light all the day. Each window presents a different view on the river Seine. Framed with elegant cream colored chintz curtains and black out curtains for maximum darkness at night. The separate bedroom is large, bathed with the light of the three high windows that offer stunning views on the River. The walls are decorated with old photographs and a 19th Century central framed mirror. 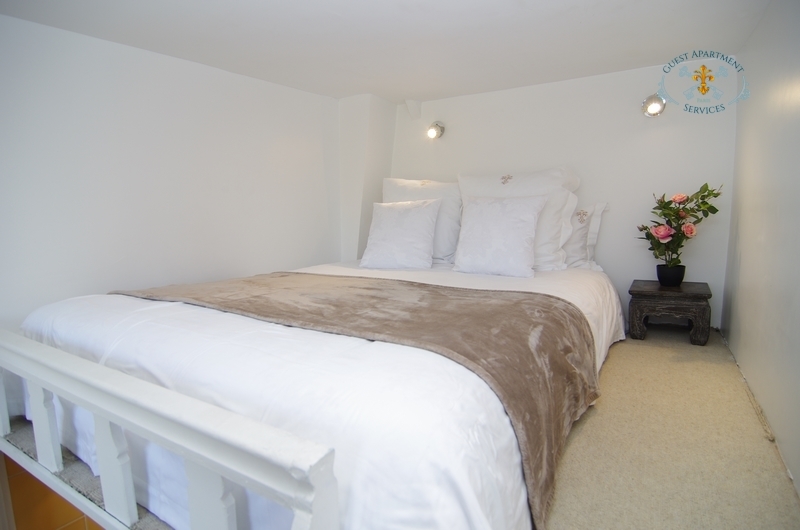 The bedroom area welcomes a New queen size bed (convertible in twin beds), that is facing the river Seine. It is adorned by two antique bedside tables and two modern reading lamps. A large antique armoire closet (for use as wardrobe with hangers) dominates one wall and complete the spirit of the room. Facing the River, a set of two black velvet armchairs and a small cocktail table welcome for a romantic tête a tête. In the corner, facing the bed, is the television with cable TV (including CNN, BBC… and other international channels), including a new DVD player or enjoying music with the stereo system including CD player. By the window, an antique convertible table with two matching chairs provide a refined space for candlelit romantic dinners. An authentic electrical crystal chandelier and wall sconces add a touch of elegance to this room. 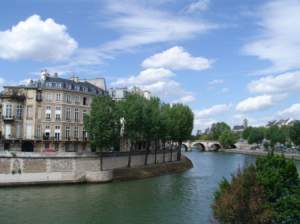 Here, you will be probably at the first seats of Seine River shows. In this Paris studio rental, you will find Cable numeric TV offering the main international channels such as CNN, BBC…, a new DVD player, stereo sound system with CD player, private telephone and answering machine. Easy access Internet connection DSL. The separate modern yellow tiled kitchen with wooden counters is fully equipped, with fridge, freezer, electrical cooker and oven, coffee maker, toaster, electrical kettle, washer/dryer and dryer unit, ironing board and iron, ample storage and all necessary cutlery, glassware and crockery. 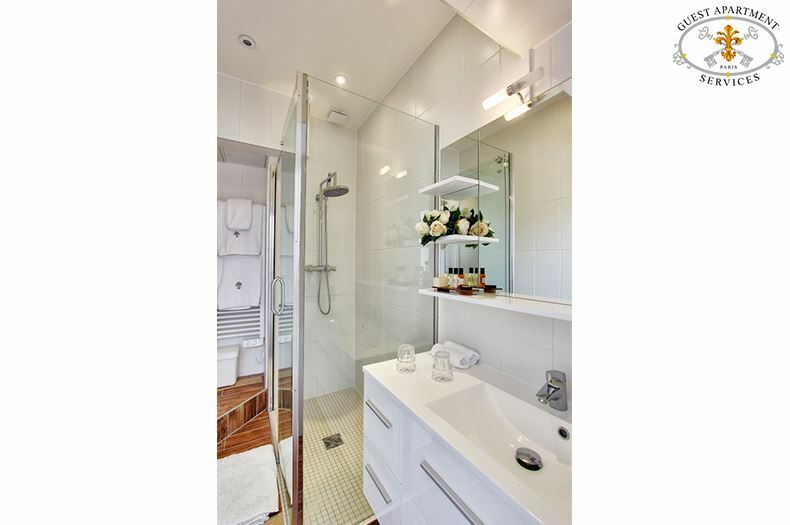 Separate bathroom with shower, washbasin, lit mirror , toileties and WC. Hairdryer available.